A primate (L. prima, first) is any mammal of the biological order Primates, the group that contains all the species commonly related to the lemurs, monkeys, and apes, with the latter category including humans. Primates are characterized by being anatomically unspecialized, with limbs capable of performing a variety of functions, refined five-digit hands and feet adapted for grasping (including opposable thumbs), comparatively flattened snouts, and prolonged pre- and postnatal development, among other features. The Primates order is divided informally into three main groupings: Prosimians, monkeys of the New World, and monkeys and apes of the Old World. The prosimians are species whose bodies most closely resemble that of the early proto-primates. The most well known of the prosimians, the lemurs, are located on the island of Madagascar and, to a lesser extent, on the Comoros Islands, isolated from the rest of the world. The New World monkeys include the familiar capuchin, howler, and squirrel monkeys. They live exclusively in the Americas. Discounting humans, the rest of the simians (monkeys and apes), the Old World monkeys, and the apes, inhabit Africa and southern and central Asia, although fossil evidence shows many species once existed in Europe as well. Based on purely biological aspects (DNA, proteins, morphology, etc. ), it is clear the humans are primates. Indeed, humans and chimpanzees share more than 98 percent identity by various molecular comparisons (protein sequences, allele differences, DNA nucleotide sequences) (Wood 2006). However, humans are also defined in cultural, spiritual, psychological, and behavioral terms that make them qualitatively very different from other primates. Despite this, effort is sometimes made to consider humans "just primates," to the extent that efforts are actually being made to legally define other primates as "persons." Primates are found all over the world. Non-human primates occur mostly in Central and South America, Africa, and southern Asia. A few species exist as far north in the Americas as southern Mexico, and as far north in Asia as northern Japan. The earliest fossils of primates date to the late Cretaceous period (Mayr 2001). The English singular, primate, is a back-formation from the Latin name Primates, which itself was the plural of the Latin primas ("one of the first, excellent, noble"). All primates have five fingers (pentadactyl), a generalized dental pattern, and an unspecialized body plan. Another distinguishing feature of primates is fingernails. Opposing thumbs are also a characteristic primate feature, but are not limited to this order; opossums, for example, also have opposing thumbs. In primates, the combination of opposing thumbs, short fingernails (rather than claws), and long, inward-closing fingers is considered a relic of the ancestral practice of brachiating through trees. Forward-facing color binocular vision would also have been useful for the brachiating ancestors, particularly for finding and collecting food, although some studies suggest it was more useful in courtship. All primates, even those that lack the features typical of other primates (like lorises), share eye orbit characteristics, such as a postorbital bar, that distinguish them from other taxonomic orders. Old World species tend to have significant sexual dimorphism. This is characterized most in size difference, with males being up to a bit more than twice as heavy as females. New World species generally form pair bonds and these species (including tamarins and marmosets) generally do not show a significant size difference between the sexes. Many modern species of primates live mostly in trees and hardly ever come to the ground. 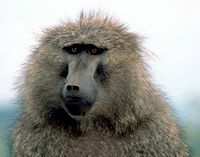 Other species are partially terrestrial, such as baboons and the Patas Monkey. Only a few species are fully terrestrial, such as the Gelada and Gorilla. Primates live in a diverse number of forested habitats, including rainforests, mangrove forests, and mountain forests to altitudes of over 3000 m. Although most species are generally shy of water, a few are fine swimmers and are comfortable in swamps and watery areas, including the Proboscis Monkey, De Brazza's Monkey, and Allen's Swamp Monkey, which even has small webbing between its fingers. Some primates, such the Rhesus Macaque and the Hanuman Langur, are common in cities and villages. The three basic groups of primates are prosimians, New World monkeys, and Old World monkeys and apes. The monkeys (New World monkeys and Old World monkeys) and apes are also referred to as simians. 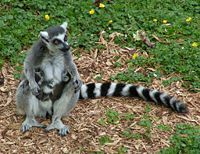 The Ring-tailed Lemur (Lemur catta) is a prosimian of the family Lemuridae. Prosimians are generally considered the most primitive extant (living) primates, representing forms that were ancestral to monkeys and apes. With the exception of the tarsiers, all of the prosimians are in the suborder Strepsirrhini. These include the lemurs, Aye-aye, and lorises. The tasiers are placed in the suborder Haplorrhini (with the monkeys and apes). Due to this reason, the classification is not considered valid in terms of phylogeny, as they do not share a unique last common ancestor or anatomical traits. The New World monkeys are the four families of primates that are found in Central and South America: The Cebidae (marmosets, tamarins, capuchins, and squirrel monkeys), Aotidae (night or owl monkeys), Pitheciidae (titis, sakis, and uakaris), and Atelidae (howler, spider, and woolly monkeys). The four families are ranked together as the Platyrrhini parvorder, placing them in a different grouping from the Old World monkeys and the apes. All New World monkeys differ slightly from Old World monkeys in many aspects, but the most prominent difference is the nose, which is the feature most commonly used to distinguish between the two groups. The scientific name for New world monkey, Platyrrhini, means "flat nosed," therefore the noses are flatter, with side facing nostrils, compared to the narrow noses of the Old World monkey. Most New World monkeys have long, often prehensile tails. Many are small, arboreal, and nocturnal, so knowledge of them is less comprehensive than that of the more easily observed Old World monkeys. Unlike most Old World monkeys, many New World monkeys form monogamous pair bonds and show substantial paternal care of young. The Old World monkeys, or Cercopithecidae family, are placed in the superfamily Cercopithecoidea in the clade Catarrhini. From the point of view of superficial appearance, they are unlike apes in that most have tails (the family name means "tailed ape"), and unlike the New World monkeys in that their tails are never prehensile (adapted to be able to grasp and hold objects). Technically, the distinction of catarrhines from platyrrhines (New World monkeys) depends on the structure of the nose, and the distinction of Old World monkeys from apes depends on dentition. 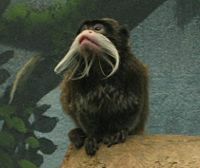 The Old World monkeys are native to Africa and Asia today, but are also known from Europe in the fossil record. They include many of the most familiar species of non-human primates, such as baboons, macaques, and colobus monkeys. There are about 135 known species of Old World monkeys. Two subfamilies of Old World monkeys are recognized, the Cercopithecinae, which are mainly African, but include the diverse genus of macaques, which are Asian and North African, and the Colobinae, which includes most of the Asian genera, as well as the African colobus monkeys. The family Hominidae, consisting of gorillas, chimpanzees, orangutans, and humans, is collectively known as the "great apes." Awkwardly, the term "hominid" is still used with the specific meaning of extinct animals more closely related to humans than the other great apes (for example, Australopithecines). In another classification, historically common, members of the Hominoidea are divided into three families, the Hylobatidae (gibbons), the Pongidae (orangutans, gorillas, chimpanzees, and bonobos), and the Hominidae (humans). In this case, the term hominid accurately applies to all human and humanlike forms, while great apes applies only to gorillas, chimpanzees, and orangutans. Some researchers place gorillas and chimpanzees (and the related bonobos) into the Panidae family, while orangutans remain in the Pongidae family, and humans in the Hominidae. The bonobos are sometimes considered a variety of chimpanzees and are referred to as pygmy chimpanzees. The eight extant (living) genera of hominoids are the four great ape genera (Homo (humans), Pan (chimpanzees), Gorilla, and Pongo (orangutans)), and the four genera of gibbons (Hylobates, Hoolock, Nomascus, and Symphalangus). The genus for the hoolock gibbons was changed from Bunopithecus to Hoolock (Mootnick and Groves 2005). A few other primates have the word "ape" in their common names, but they are not regarded as true apes. Both great apes and lesser apes fall within parvorder Catarrhini, which also includes the Old World monkeys of Africa and Eurasia. Within this group, both families of apes can be distinguished from these monkeys by the number of cusps on their molars (apes have five—the "Y-5" molar pattern, Old World monkeys have only four in a "bilophodont" pattern). Apes have more mobile shoulder joints and arms, ribcages that are flatter front-to-back, and a shorter, less mobile spine compared to Old World monkeys. These are all anatomical adaptations to vertical hanging and swinging locomotion (brachiation) in the apes. All living members of the Hylobatidae and Hominidae are tailless, and thus humans have been referred to as tailless, bipedal, primates. However there are also primates in other families that lack tails, and at least one (the Pig-Tailed Langur) that has been known to walk significant distances bipedally. Except for gorillas and humans, all true apes are agile climbers of trees. They are best described as omnivorous, their diet consisting of fruit, grass seeds, and in most cases some quantities of meat and invertebrates—either hunted or scavenged—along with anything else available and easily digested. The apes are native to Africa and Asia, although humans have spread to all parts of the world. Most ape species are rare or endangered. The chief threat to most of the endangered species is loss of tropical rainforest habitat, though some populations are further imperiled by hunting. Many people do not consider the term "apes" to include humans, although biologists generally do consider humans as apes. The terms "non-human apes" or "non-human great apes" is used with increasing frequency to both show the relationship of humans to the other species classified in the families Hylobatidae and Hominidae, while maintaining the distinction of humans. The Primate order lies in a tight clustering of related orders (the Euarchontoglires) within the Eutheria, a subclass of Mammalia. Recent molecular genetic research on primates, flying lemurs, and treeshrews has shown that the two species of flying lemur (Dermoptera) are more closely related to the primates than the treeshrews of the order Scandentia, even though the treeshrews were at one time considered primates. These three orders make up the Euarchonta clade. This clade combines with the Glires clade (made up of the Rodentia, rodents, and Lagomorpha, rabbits) to form the Euarchontoglires clade. Variously, both Euarchonta and Euarchontoglires are ranked as superorders. Also, some scientists consider Dermoptera a suborder of Primates and call the "true" primates the suborder Euprimates. In older classifications, the Primates were divided into two superfamilies: Prosimii and Anthropoidea. The Prosimii included all of the prosimians: All of Strepsirrhini plus the tarsiers. The Anthropoidea contained all of the simians. In modern cladistic reckonings, the Primate order is also a true clade. The suborder Strepsirrhini, the "wet-nosed" primates, split off from the primitive primate line about 63 million years ago (mya). The seven strepsirhine families are the four related lemur families and the three remaining families that include the lorises, the Aye-aye, the galagos, and the pottos. Some classification schemes wrap the Lepilemuridae into the Lemuridae and the Galagidae into the Lorisidae, yielding a three-two family split instead of the four-three split as presented here. Other lineages of lower primates once inhabited Earth. During the Eocene, most of the northern continents were dominated by two dominant groups, the adapids and the omomyids. 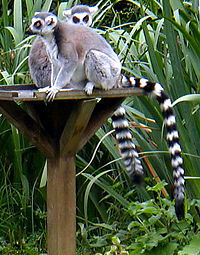 The former is considered a member of Strepsirrhini, but it does not have a tooth-comb like modern lemurs. The latter was related closely to tarsiers, monkeys, and apes. Adapids survived until 10 mya; omomyids, on the other hand, perished 20 million years earlier. The Aye-aye is difficult to place in Strepsirrhini. Its family, Daubentoniidae, could be a lemuriform primate and its ancestors split from lemur line more recently than the lemurs and lorises split, about 50 mya. Otherwise, it is sister to all of the other strepsirrhines, in which case it evolved away from the main strepsirrhine line between 50 and 63 mya. The suborder Haplorrhini, the "dry-nosed" primates, is composed of two sister clades. The prosimian tarsiers in family Tarsiidae (monotypic in its own infraorder Tarsiiformes), represent the most primitive division at about 58 mya. The Simiiformes infraorder contains the two parvorders: The New World monkeys in one, and the Old World monkeys, humans, and the other apes in the other. This division is considered to have happened about 40 mya. However, about 30 mya, it is thought that these three groups split from the main haplorrhine lineage. One group stayed in Asia and are closest in kin to the "dawn monkey" Eosimias. The second stayed in Africa, where they developed into the Old World primates. The third rafted to South America to become the New World monkeys. Mysteriously the aboriginal Asian Haplorrhini vanished from record once Africa collided with Eurasia 24 mya. Apes and monkeys spread into Europe and Asia. Close behind came lorises and tarsiers, also African castaways. The first hominid fossils were discovered in Northern Africa and date back 7 mya. Modern humans did not appear until 0.2 mya, eventually becoming the most prevalent primate and mammal on Earth. The discovery of new species happens at a rate of a few each year, and the evaluation of current populations as distinct species is in flux. Colin Groves (2001) lists about 350 species of primates in Primate Taxonomy. The recently published third edition of Mammal Species of the World (MSW 2005) lists 376 species. But even MSW3's list falls short of current understanding as its collection cutoff was in 2003. Notable new species not listed in MSW3 include Cleese's Woolly Lemur (named after British actor and lemur enthusiast John Cleese) and the GoldenPalace.com Monkey (whose name was put up for auction). Humans are the only apes recognized as "persons" and protected in law by the United Nations Universal Declaration of Human Rights and by all governments, though to varying degrees. The non-human apes are not classified as persons. This has generated much debate, particularly through the Great Ape Project Declaration on Great Apes, which argues for their personhood. Many argue that the other apes' cognitive capacity in itself, as well as their close genetic relationship to human beings, dictates an acknowledgment of personhood. However, despite genetic and morphological similarities between the other great apes and human beings, the gulf between these species is qualitatively immense. References in the Universal Declaration of Human Rights itself is indicative of many fundamental aspects of Homo sapiens that are unthinkable for chimpanzees, gorillas, and organgutans. Among these are rights related to religion, politics, freedom of conscience, the arts, scientific advancement, government, and so forth. One role that many humans see for themselves is as stewards of creation, with the responsibility to care for other living organisms. Despite this, however, thousands of primates are used every year around the world in scientific experiments because of their similarity to humans. The species most commonly used are chimpanzees, baboons, marmosets, macaques, and African green monkeys. However, in general, there are many more laws protecting primates, and mammals in general, than are protecting invertebrates, fish, amphibians, and reptiles. Mootnick, A., and C. P. Groves. 2005. A new generic name for the hoolock gibbon (Hylobatidae). International Journal of Primatology 26:971-976. Wood, T. C. 2006. The chimpanzee genome and the problem of biological similarity. Occas. papers of the BSG 7:1-18. This page was last modified on 7 November 2011, at 15:45.